Our service helps organizations and individuals create, manage and promote their events. With elegant designs and sleek functionality, Sendo makes party planning easy. 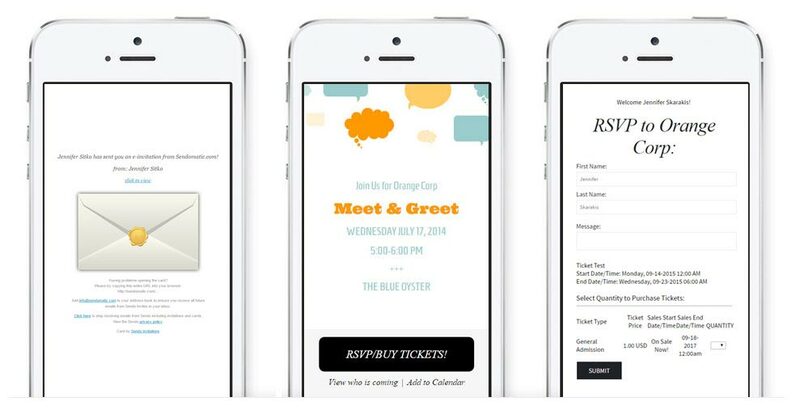 Create email invitations and customize for any occasion. Start with one of our pre designed templates, create your own or have us create a custom design for you. Set up and sell event tickets online in minutes. Allow your guests to print tickets with QR barcodes and manage event registration easily. Funds deposited instantly to your account. Sendo is advertisement free for you and your guests - no advertising what so ever on our site or emails. Give love to our planet - No paper, stamps or mail carrier used! 100% digital event planning. Go ahead take Sendo for a spin - Takes only 5 minutes to create & send! Create an Online Invitation here! "I have used Sendo Electronic Invitations for three years for a very important function my company has with our biggest client. I absolutely love it. It makes it effortless to keep track of responses and plan a great event. " A flexible e-invite platform that can be used for any event. 100% Customizable. Upload your own design, use one of our existing designs or have us create a custom design for you!